September 6, 3114 BC, is the supposed start date for the Mayan Long Count Calendar. The Mayan calendar ends with a cataclysm, which is actually fast approaching. On our calendar, the cataclysm is set to take place on December 21, 2012. On Sept 7, 1776, the first submarine attack took place, when the Americans used a submersible craft called the Turtle to attack British Admiral Richard Howe’s flagship HMS Eagle while it resided in the New York Harbor. The boat, designed by David Bushnell, consisted of two wooden shells covered by with tar and reinforced by steel bands. It was 8 feet across and six feet tall and was built to be piloted by one man. It submerged by allowing water into the bilge tank, and surfaced by pushing water out through a handpump. It contained approximately 30 minutes of oxygen. Benjamin Franklin came up with the idea to use foxfire inside the submarine, as a regular flame would have depleted the oxygen at a quicker rate. The attack, which was piloted by Sergeant Ezra Lee, was unsuccessful. After two attempts to drill through the hull of the ship, Ezra was forced to give up and flee. On September 10, 1945, farmer Lloyd Olsen, from Fruita Colorado went out in his yard to kill a chicken for dinner. He beheaded the chicken, but surprisingly enough – the chicken did not die. He did not completely decapitate the head, leaving the jugular vein intact as well as one ear and most of the brain stem. The bird, later affectionately called “Mike” by the Olsen family, lived for another 18 months. Lloyd would feed the bird by using an eyedropper (I would assume pouring it directly down the throat.) The rooster occasionally had a buildup of mucus in its throat, which the Olsens would help clear using a syringe. The authenticity of this was proven by the University of Utah. The Olsens took their headless chicken Mike on a roadshow, charging a quarter to see it and raising about $4,500 a month (the equivalent of $50,000 in 2005.) The bird died 18 months after losing its head – some sources say the death was caused by a buildup in mucus, but the following video says Mike choked on corn. Next Post Measure for Measure…How much energy is there? 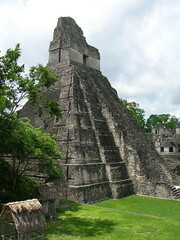 2012: Did the Maya Predict an Apocalypse?